The Rapture Project places the tangled debate between Fundamentalism and Tolerance in the hands of black-and-white-clad puppeteers, creating a fascinating and morally-nuanced play that leads us to read between the proscenium arches and wonder just who is pulling our strings after all. “Rapture”, a Latin word, literally means “to be caught up or snatched away.” What better way to set the stage for a play about the End-Times and all thereafter than the use of puppetry? Bound as puppets are in their own strings, they only look alive when they are hovering hesitantly over seemingly solid ground. Furthermore, for the tangled dilemma that is Fundamentalism versus Tolerance, nothing beats an old-fashioned puppet show in metaphorical relevance or good clean fun. Great Small Works, the Obie and Jim Henson Award winning collective of artists, was largely responsible for the revitalization of toy theater in New York City, bringing paper cut-outs, puppets and tiny proscenium arches to the city’s downtown and outer-borough theater scene. Now, at the HERE Arts Center this month, Great Small Works picks up the marionettes once again, and, with The Rapture Project, they have indeed got the world on a string. The Rapture Project is an impressive undertaking, inspired by 19th century Sicilian puppet theater, 1920’s apocalyptic artwork, and the 1960’s hallucinations of San Francisco theater designer Jilala. The production combines music, puppets and live performances as a sort of 21st century anti-Revival. Soon the puppet show begins, and we are transported to a world “when times are scary and nothing seems just” where “you need answers, something you can trust.” In other, less metrical words, we are transported to a world of Fundamentalism, into its deepest ring, the ring of the Born-Again Christian and his God-driven quest to covert the heathen Muslims. The Rapture Project presents a humorously tongue-in-cheek examination on the perversion of faith, satirically naming both Peace in the Middle East and decent dental care sacrilegious goals of the Anti-Christ. However, the play’s true intelligence and entertainment isn’t so much what is said (as by now most New Yorkers know the case against Bush and the Religious Right as well as Pinocchio knows the inside of a whale) but in who is speaking; out of the mouths of puppets and puppeteers hast The Rapture Project ordained strength against its enemies. In a play so anti-Bush, it’s odd that most of The Rapture Project still works in binaries of Good and Evil. Yes, GSW’s Evil is not Bush’s Evil, but it is an Evil nonetheless – an Evil of intolerance, greed and violence. Perhaps moral ambivalence isn’t the best fit for toy theater, a genre most often used today by children acting out fairytales with paper dolls and brightly-hued pipecleaners – still, The Rapture Project persecutes the American Religious Right with the same fervor and delight Bush employs in his verbal attacks against Middle Eastern Muslims. The Creator’s hand alone transforms this show from a witty exercise in hypocrisy into a deeply thought provoking, morally nuanced and wholly fascinating production. No, that’s not God’s hand, but the hand of the Puppeteer. The slight intrusion of a human arm in the upper corner of the proscenium arch; a puppeteer’s acknowledgment to the audience that two strings have tangled together; the finally removal of the stage’s top border, revealing the shoulders, arms and faces of the puppeteers themselves – all The Rapture Project’s self-conscious staging choices pull the attention off the literal and onto the bigger picture (not coincidentally, the most persuasive argument against Literal Christianity isn’t in any of the scripted, but in these staging choices and how they affect the tone of the show). 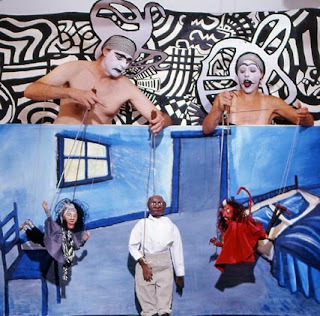 Yes, the action of the play suggests the moral that “Fundamentalism = Evil, No Questions Asked,” but with the puppeteers visibly manipulating the puppets below, a second, far more interesting moral surfaces – the moral that simply binary systems (and all the stereotypes that arise from them) need to be deeply questioned as long as someone else is pulling the strings. The Rapture Project sets out to cleave the universe into just another set of Right and Wrong – however, in the end, the show completely fails at that goal (thank God), and instead of a black and white morality tale, we are given an equivocal, debatable and dialogue-encouraging reflection of all our own political and social paradoxes, no strings attached. Performances: January 4th through 21st, Thursday and Friday at 7pm, Saturday at 7pm and 10:30pm, and Sunday at 2pm.